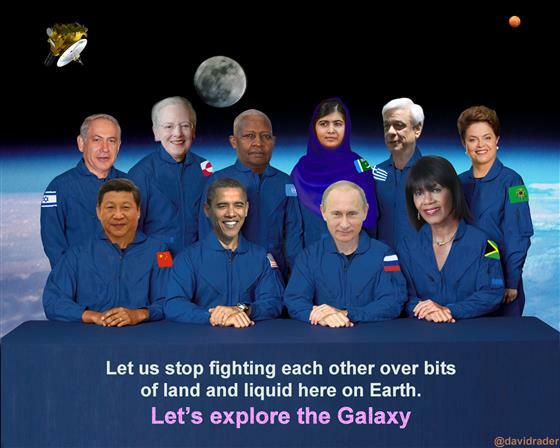 No one in or involved with the satire space picture I made have endorsed its creation. I would like to think- and hope that they would endorse it though. Call me a dreamer, but I often like to think big and positive. This project took me many days, most notably because I was trying to find the "most open" license sources. Also, most of those sources require the image be posted with credit, so that was a lot of logging considering the number of photos used in this composite. I used Wikipedia to source most of these images, however, I tried to provide the best link to the original authors. To my knowledge, the licenses are as stated. Please do your own research if your are to use them. Hosted by HostNine This page was created in 0.00239419937134 seconds.